Garden Benches For Sale. Australia wide delivery. A beautiful inviting garden bench is the perfect way to make the most of your outdoor space. Garden furniture (with matching accessories) is functional and adds another feature or focal point to outdoor décor. 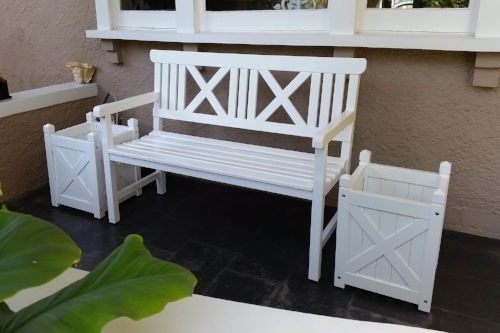 We recommend painted garden benches be kept under cover or re-painted on a regular basis to ensure water doesn't penterate the paint and soak in to the wood. For more photos of each item click on the title or the image. We can ship these gorgeous garden benches to Perth, Melbourne, Adelaide, and other addresses all around the country. 130cm W x 90cm H x 50cm D. Seat height is 40cm.